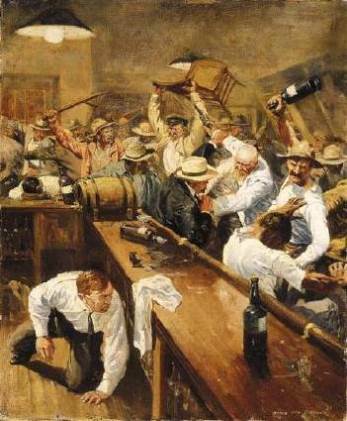 Those of my generation, when there was no mass media or Internet (yes, young readers, there was life on the planet before the Internet), we would remember what was a bar fight or a bar room brawl. In the cinematic version coming from Hollywood at a10:00 a.m. western movie, shown in Strand Globe, Ritz or Rialto cinemas, a drunken cowboy, fresh off the range and stink* would spill a drink, cheat at cards or call someone 'yaller'. For the next 10 minutes fists would fly, tables would be broken, glasses would be smashed until someone was thrown into the street bruised but wiser. Or the sheriff would show up towards the end and haul the 'varmint' off to jail. The piano player, on pain of being beaten or shot, was never to stop playing. In real life a drunk, a badjohn, or a man who could not take a fatigue/joke, would hit someone or make carnal references to somebody's mother. That led to buss head, stab with a broken bottle or a man 'stopping a 2x4 piece of wood with his waist or head. Or if you lose in the wappie game you could challenge the casa and see where that was going to take you. Such fights would later enter our folklore and the men became heroes and petty cult figures. Lil Ax, Musso, Mastifay, the Bonneterres from South, Joe Pringay, Wagon Master from San Juan, Cut Outer, Boysie Singh and so many more. Today's Bar-room brawls are held in the Halls of Justice, judges' chambers, at meetings of the Law Association and in the print and electronic media, day and night. The Bar-risters fight among themselves. These bar-risters did not attend Lincoln’s or Gray’s Inns of Court, but rather Beepath’s Inn on Leotaud Street in Sando. The really big gangs are made up of 'silks'. Then there are 'legal advisers' who hire out to the "Sherriff/State''. In the western movies they would be guns for hire (Have Gun Will Travel) or bounty hunters. Unlike the fights then, the brawls/Bar-wrals we are having now have been going on for weeks and seem to be showing no signs of abating. The top Bar-wler in the land has just found out that it was his children 'out on the range', although the top Sherriff (Marshall) told us so almost immediately so he is not bothering. Another top notch fighter just came in from Barbados and is reportedly on his way to the USA. Actually he is the one who started the ruckus when he put a woman in a house she was not supposed to live. When his former pardners start to complain about Madame Dracula he lash back with a Terror classic Dat woman could lie and his former pardners started saying he did not check out the babe and if he so easy to fool…well! Folks: this horror movie has lasted longer than any 'double/double feature' shown way back then. But we, the ordinary movie fans, stopped finding such real live movies entertaining a long time ago. We know the actors, like TV wrestlers, are indeed fakes. *There is an old local phrase “taking a cowboy''. That means taking a really quick bath since we never saw a cowboy bathe, unless it rained or he fell/was thrown into the water trough where the horses were tied.